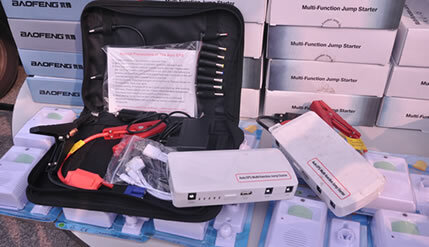 BANGI, 2 Nov 2014 – A power bank that can jump start a car battery is one of the many products found at the entrepreneurs booth at the UKM convocation here. The power bank is showcased by Sarcasteek a renowned novelty merchandise company. Saarcasteek is one of many social business set up by Saiful Nang the millionaire photographer. It is a company owned by Rumah Pengasih dan Warga Prihatin (RPWP) a welfare home with a difference. The home was co-founded by Saiful Nang and 20 other benevolent individuals who decided to give their business income to support RPWP. The booth is easily noticeable as it sells t-shirts a wife will love to buy for her husband. It is printed with the words “A handsome man is always somebody’s husband” and “The property of my wife”. One of the co-founders, Ahmad Khairudin Mohd Nor said the booth is meant to give exposure on entrepreneurship to children from the home. Some of the children aged 9 to 14 who were at the booth were very eloquent and very customer friendly. But Ahmad said there were not always like that for when they first came to RPWP most were traumatized by the death of their parents. They hardly smiled for the first 6 months, but now they can laugh and convince customers as well. RPWP used the concept of social business to finance the 120 children in the home. Sarcasteek is only one its social businesses as RPWP also has a second hand car dealership, a photography academy and photo gallery. The income earned from the businesses is used to support and up-keep the home and undertake various programmes to develop the children. The children are taught how to start a business and helped every step of the way. The CEO of Sarcasteek used to be one of the underprivileged children taken in by the home. RPWP takes in underprivileged children from broken homes, orphans and even delinquents and turn them into street smart entrepreneurs thereby becoming indispensable members of the community. Thus the home is self sufficient and do not depend on donations. It can be assessed by logging on to www.prihatin.net.my. In any case those wanting to contribute and have a t-shirt to make their wives happy go to www.sarcasteek.com.